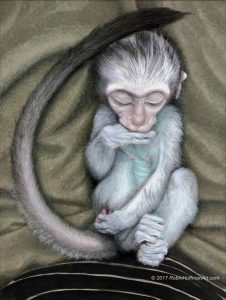 Robin Huffman’s characteristic art is large-scale representational paintings, close-up portraits of apes and monkeys, most of whom she has personally cared for at primate sanctuaries in Africa and the U.S. Almost all are orphans due to bushmeat hunting, trafficking, deforestation, the pet trade, research or entertainment industry. 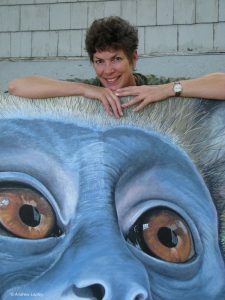 Not only did the remarkable primates and their stories move her to leave the corporate world to care for them, they inspired her portraiture talent in the process. Now Robin shares paintings, photographs, voices, stories and intimate knowledge of these intelligent beings to improve their condition, raise awareness and inspire others to help. Robin uses the proceeds of all art sales to make donations to wildlife conservation and to continue her own primate advocacy efforts.